The Ergobaby Omni 360 baby carrier brings together the newborn-suitable features of the Ergobaby Adapt, and the world-facing features of the Ergobaby 360 into one fantastic carrier. 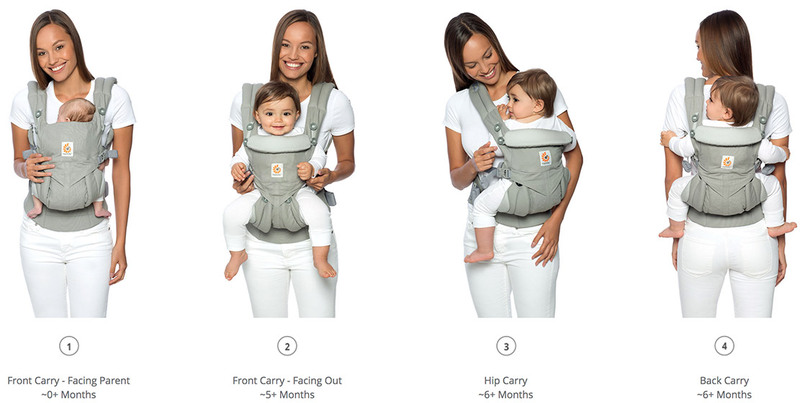 The Ergobaby Omni is suitable from newborn onwards (around 7 - 33 lbs / 3.2 - 15 kg). There is no need for any inserts, thanks to the adjustable width and height of the seat area. It narrows across the width and height for younger babies and adjusts with them as they grow. The Omni can also be used in the world-facing position. Expert recommended: if you want a carrier to use from birth, with the option of world-facing positioning, then the Ergobaby Omni is a superb option for you. Adjustable from newborn to toddler. Lumbar support for extra back comfort.